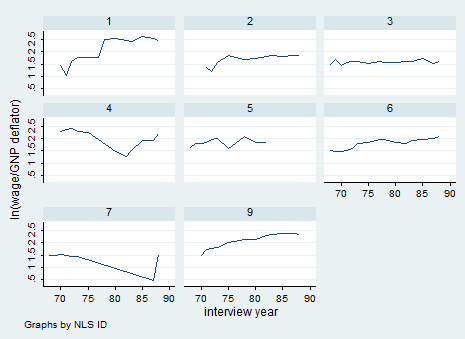 Learn Panel Data proficiently on Stata using 5 minutes of your time and you won’t regret it! Contrary to what I said up to now, today I am going to provide you a short theoretical explanation of the topic. Why? Because I think, panel data are so important that you cannot allow yourself to do not understand them. Let’s start. Now, let’s make an example. Imagine we can explore if alcohol taxes may be a means to reduce traffic deaths. If we can demonstrate there is a relation, several state policies can be implemented to reduce the number of deaths due to transports. 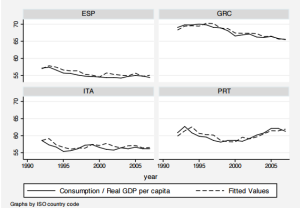 Why might there be more traffic deaths in states that have higher alcohol taxes? Because there are other factors such as density of cars on the road and culture that we are not considering and that determine traffic fatality rate. These omitted variables affect OLS estimates that are no more consistent. That is why we need Panels. The first thing we must do when we want to play with Panels in Stata is to use the command xtset; it declares to Stata that we are going to use longitudinal data. Let’s call back the dataset nlswork we already discussed in the OLS post. 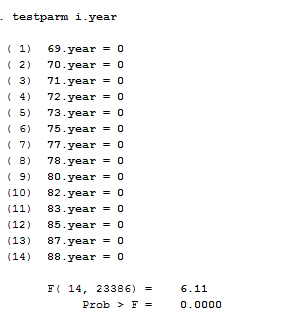 I specified the yearly option to help Stata understanding the time unit is year and not months or days. As we can notice, our panel is unbalanced in the sense that several idcode, which represent interviewed women, have missing observations for some characteristics across the time range. Useful Tip. If you get the error “string variable not allowed” after using xtset it means that your identifier variable is a string instead it should be a numeric so you can use the command encode, as explained here. If we want to describe our data, another useful command is xtsum. This provides us the mean, the minimum and maximum of the selected variables and the standard deviation. It shows three different estimates. The overall estimate is the total number of individual for the number of years N = n x T. We are dealing with 28500 observations more or less. Between is the estimate that shows between women the number of observations in each characteristics. Within instead shows within each woman the number of observation of the selected characteristics in the time range. In this case it is not useful because we are using micro data but it may be useful with macro data even with the overlay option so keep it in mind! 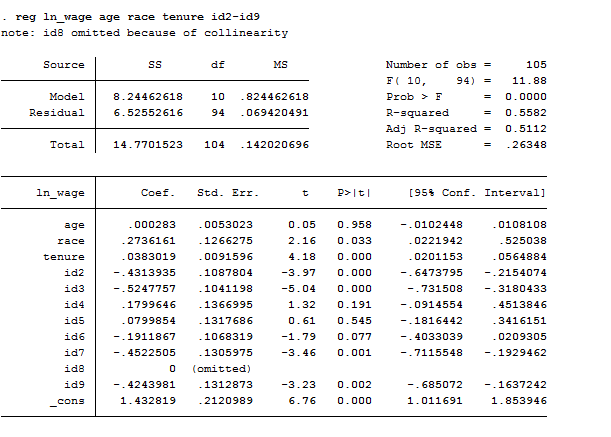 reg ln_wage age race tenure, cluster(idcode) // If you suspect there’s correlation across women. 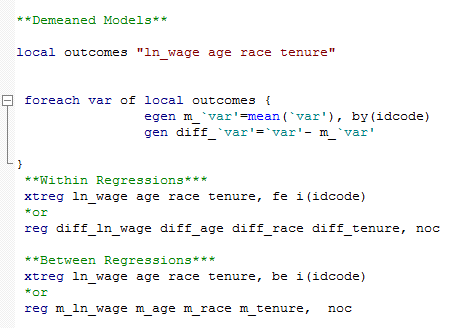 I recommend using FE models whenever you want to analyze the impact of variables that vary over time because it explores the relationship between these factors and the outcome variables within entities (i.e. country, person, company). We use them when we believe that something within the individual may bias the predictor or outcome variables and we are not controlling for it. Fixed effect estimation removes the effect of those time-invariant characteristics. The assumption behind is that those time-invariant characteristics are unique to each entity and should not be correlated with other individual characteristics. 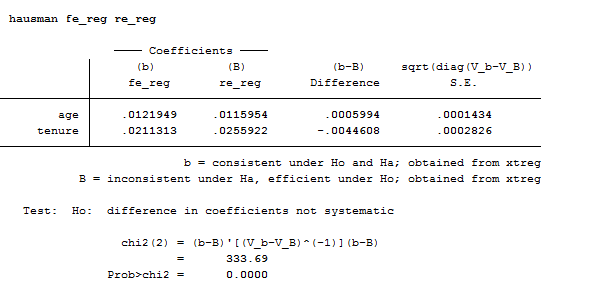 If the error terms of the estimated regression are correlated, it means that there are individual characteristics that are correlated with characteristics of other individuals so FE is not suitable and you might need to use the Hausman test to check its correctness against a random effect model. You can use several methods to compute your Fixed Effect model. The first one is using the Least Square Dummy variable regression where dummy variables are created for each entity (except one to avoid multicollinearity) and are included in the model. 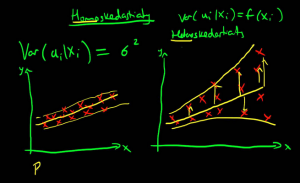 This technique might be time consuming and it can produce many coefficients that you are not interested in but it is useful to investigate cross-individual correlation! 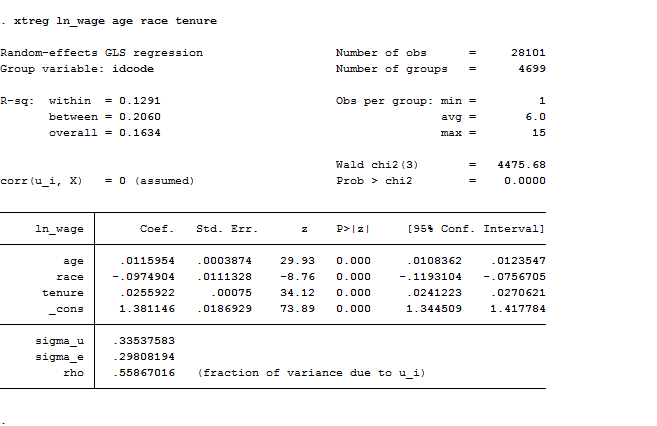 Alternatively, we can add time and entity effect to the model to have a time and entity fixed effect regression model. 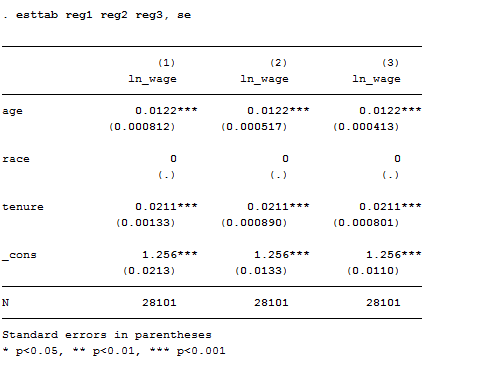 Finally, we can construct a within regression by demeaning each variable (both regressors and outcome). Hence, within each entity, the demeaned variables all have a mean of zero. You can use this to get rid of all between subject variability. N.B. if you have time-invariant variables such as gender in your analysis and you apply a demeaned model this demeaned gender variable will have a value of 0 for every individual and, since it is constant, it will drop out of any further analysis. Before looking at regression command, I am going to give you two way to graphically check if you have heterogeneity across individuals or across years. The second set of commands allows you to control for unobserved variables that do not change over time. Here we are! Let’s start with regressions. 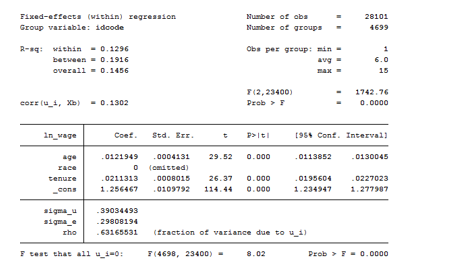 This regression is useful if you want to know if the difference in women effects is statistically significant. We include the intercept and the dummies (except one) however, one of the dummies is dropped due to perfect collinearity of the constant and all the other dummies are represented as the difference between their original value and the constant. Otherwise, we can calculate the fixed effects model including dummy variables for each woman instead of a common intercept. The only change is the substitution of a common intercept for 8 dummies, each of them representing a cross-sectional unit. It provides a good way to understand fixed effects because the effect of age, for example, might be mediated by the differences across women. By adding the dummy for each woman, we are estimating the pure effect of age. As we can see from the table below, the xtreg model suffers of collinearity. The intercept is an average of individual intercepts. As we can see from the table constructed using estout the third model is the one that better fit out data. The underlined hypothesis is that we are not facing serial correlation neither heteroskedasticity. To perform a between model you can use the be option after xtreg or construct a demeaned model in the do-file that you might also use it for within estimation. In this case, the variation across entities is assumed to be random and uncorrelated with predictors or the outcome variable. . Its advantage is that we can include time invariant variables like gender because it assumes that the entity’s error term is not correlated with the predictors. You can estimate random effect directly typing xtreg or adding the re option. The Hausman test allows you to decide between fixed or random effects. Its null hypothesis is that the preferred model is random effects and it tests whether the unique errors are correlated with the regressors. If the model that fit better the data is a random effect than the null hypothesis is that the errors are uncorrelated. If the Chi-statistic is negative then the test is not conclusive. In our case, we should prefer and use a fixed effect model. If we are not sure that we need to control for time fixed effects when running a Fixed effect model, we can use the command testparm that performs a joint test of significance. You can check if the dummies for all years are equal to zero. Considering that the Prob>F is smaller than alpha (0.05) we reject the null hypothesis that the coefficients for all years are jointly equal to zero confirming that time fixed-effects are needed in our case. 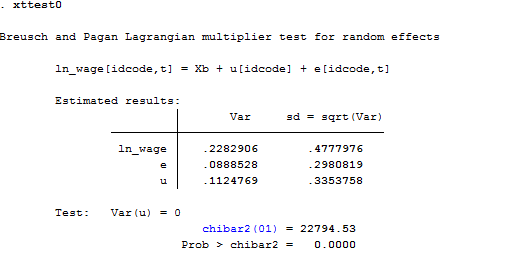 The Breusch-Pagan Lagrange Multiplier test is what we need to decide between a random effects regression and a simple OLS regression. Its null hypothesis is that variances across entities is zero. Thus, there are not panel effect because there is no significant difference across units. The command in Stata is xttest0. Here we reject the null and conclude that random effects is the appropriate model because there is evidence of significant differences across women. As a result, OLS is biased. It’s All for Today! Stay tuned for more posts.